1. The snow. It’s better in March. And more prolific. Statistically, March is the snowiest month of the year here in Stowe. So while your crocuses are struggling to poke their heads out of the ground, we’re still shoveling our driveways out and enjoying plenty of powder days. While I’m not going to make any predictions about this year, one year we received 10 feet of snow in March. March means snow in Stowe. 2. The sun & the temperature. It’s just milder in March. Winter’s back is broken the final week of February, and though we still get plenty of snow, the milder, moister air means more inches per snowfall. Sunnier days abound, too, as northern Vermont’s weather pattern changes, inducing spring’s advance. In March, we get rid of the neck gaiters and face warmers and frozen fingers and toes, and focus on why we fell in love with skiing in the first place. 3. Sugaring. March means sugaring, and if you’ve never experienced it, you got to come up and see it for yourself. Modern sugaring operations involved tubing and boiling, and the air is thick with the sweet smell of sweetwater turning into syrup every afternoon. There are several sugaring operations to visit in the area, where you can watch the magic and pick up a jug of Vermont’s finest to take home. 4. The empty slopes. I’ve never waited more than a couple of minutes in line during the month of March, and this includes Saturdays. This equals more runs per day. And this year, Stowe has installed electronic ticket readers and a brand new, high-speed quad, which translates into more time on the slopes. 5. St. Patrick’s Day. This year, the high holy day falls on a Saturday. So tell my, do you want to spend your St. Paddy’s Day in a crowded bar filled with weepy-eyed, seventh-generation Irish Americans singing “Wild Colonial Boy” and puking on the sidewalk, OR do you want to spend St. Paddy’s Day in a crowded bar filled with weepy-eyed, seventh-generation Irish Americans singing “Wild Colonial Boy” in Stowe with ski bunnies and ski bums? Plus there’s McCarthy’s traditional St. Patrick’s Day breakfast AND O’Grady’s Pub AND the frozen green waterfall under the gondola AND I’ll buy you a pint of Guinness--just ask! 6. The woods. If you’ve never experienced off-piste skiing, March is the month to try it, and Stowe’s side-country is the place to do it. From Angel Food to the Planets to the Bruce Trail to Snuffy’s Trail, Stowe has as many secret stashes of unadvertised trails off-piste as they do on-piste. And if you’d like a guide, just ask, I’d be happy to show you around. 8. Cross-country skiing. Okay, I freely admit that the closest I get to cross-country is my 2006 Volvo XC70, but in principle I love it. Plus, when I get old and start to wear out, I plan on becoming a cross-country skier--and why not? Trapp Family Lodge has one of the best ski areas in the east, and Stowe Mountain Resort’s Nordic area is world class, too. And there’s all that aforementioned sunshine, warmer temps, ski bums & bunnies, beer, etc. The great thing about cross-country skiing, in my opinion, is that you burn so many calories doing it, you can eat and drink more later. Isn’t that the point of life, anyway? 9. You don’t have to fly anywhere to experience spring skiing. In March, the weather is warmer, and that means that we’re just a car ride away (5 hours from NYC, 3 ½ hours from Boston, 2 hours from Montreal). And by spring skiing, I don’t mean gobs of gloppy, sticky snow. I mean tons of fresh snowfall and longer, milder days. I mean hanging out on the deck at the Octagon or by the fire pit near Spruce Base. I mean picnicking up at Sterling Pond and returning by Snuffy’s Trail. That’s spring skiing. I could go on, of course. There are scores of reasons to come and ski in Stowe in March. But you get the idea. See you on the slopes! One of the things that passes for sport in Stowe is watching the restaurant scene. For me, the guy whose restaurant experience was defined by the running tab I kept at the 11th Chapter Saloon in Somerville's Union Square, this has been a revelation. That's a long way of saying I'm easily pleased, far from persnickety when I dine out. I still have to pinch myself in order to believe that someone's serving me food. Recently, two new restaurants opened in Stowe, and we broke one of our cardinal rules of dining out: don't eat at a new restaurant for at least a month, until they've had a chance to work out the bugs. This is a philosophy validated recently by Seven Days food writer Corin Hirsch, who reviewed a new Burlington bistro. In the article, Hirsch patiently waits for the restaurant to smooth out its new wrinkles, and by all accounts, the wait was worth it. The article is a must read for everyone who rushed out to eat at Stowe's two new offerings and were underwhelmed. As innkeepers, it's almost mandatory for us to check these places out as soon as possible. Right now we're in the middle of the busy ski season, and when people come through the door, the first question they ask is, "Can you recommend a restaurant?" And since there's no quid pro quo between us and the restaurants here in town (which I find shocking! ), our recommendations are truly our own, based on our experiences and the feedback we receive from our guests. A former innkeeper that we knew was famous for visiting restaurants during their opening week, and inevitably bad reviews followed the experience. After this week, we're going to go back to our original game plan of waiting at least a month, like Corin Hirsch. We'll send our guests out on restaurant recon missions, cataloguing their information. Then, in the off season, we'll hit these new restaurants again, when we'll hopefully experience them in a smoother environment. Skiing! Vermont! Deals! Stowe! Really! Sometimes, that’s how I feel about advertising: just like Stuart Mackenzie. The most recent conflict arose this week, when we had a cancellation before the Martin Luther King three-day weekend. This has traditionally been a strong weekend for innkeepers and ski resorts, but this year we’ve been hearing that things are a little soft. That may be because there’s no snow from about Bethel, Vermont, south, meaning that our traditional drive market--folks in suburban Boston, Connecticut, and New York--don’t have skiing on their minds. The question isn’t “Should we get the word our about our unexpected vacancy?”; rather, it’s “Which way should we advertise our openings?” Facebook, Twitter, et al, are the logical choices, for their immediacy. But there’s also the question of this blog space, which has been a respite from the blatant and vacuous commercial applications found in other lodging blogs. 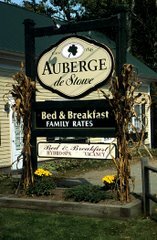 This blog is a spot for me to honestly explore my experience as a writer and innkeeper, not to drop in obvious keywords about Vermont and ski specials and lodging and Stowe and winter activities and Vermont--did I mention Vermont yet? Anyway, I think I’ll stay closer to the spirit of Charlie Mackenzie, and I’ll interpret his vision of the Colonel as the kind of crass commercialism that I believe has gutted the original spirit of innkeeping: “I hated the Colonel, with his wee, beady eyes! And that smug look on his face! ‘Oh, you’re gonna buy my chicken!’” Or rent my rooms. Oh, ohhhh.